Take advantage of this 2-day Super Saver package that couples two top-selling tours in Lisbon, a walking tour and a full-day trip to Cascais and Sintra all at one low price. Your time in Lisbon is precious, so make the most of it with a small-group walking tour that comes with wine and food samples. You’ll visit the capital’s historical districts and see its stunning monuments too. Then, journey to the countryside and coast for another amazing tour where you will see beaches, cliffs, and castles. Enjoy personal attention from your guide on each of these small-group tours. This Super Saver gives you a taste of Lisbon’s attractions and culinary delights, and is ideal for travelers with their own accommodation who would like to discover the city as well as its surrounding towns. You choose which tour you want to do first (you will need two days to do both tours). This 2-day package introduces you to Lisbon’s rich culture and amazing food and the surrounding region’s stunning castles and breathtaking landscapes. Start with an expertly guided walking tour and enjoy culinary delights. You will taste local bites and sip wine and beer as your stroll through Lisbon’s famous districts. On day two, travel to Sintra and Cascais and discover why Portugal’s royalty spent summers vacationing here. Not only will you visit UNESCO-listed castles and towns, but you will capture some of the best coastal views the country has to offer. See the Itinerary section below for details. See and taste your way through Lisbon on this small-group walking tour. Begin at Restauradores Square and explore the neighborhood of Mouraria, a melting pot of cultures where tourists don't often venture. Next, visit a small bakery where traditional pastries and coffee offer a treat. Walk past the beautiful Gothic-style Rossio train station and visit Rossio Square. Stop for another taste of Portuguese cheese and locally made marmalade. Continue to the picturesque viewpoint of São Pedro de Alcântara for a cold glass of Portuguese beer and to enjoy wonderful views over the city and the castle. Walk through the old district of Chiado, and then take a short ferry ride on the River Tagus toward Cacilhas, where samples of Portuguese wine and freshly caught seafood await. Enjoy views from the south bank before returning to central Lisbon. Experience the natural and historical beauty of Portugal on a small-group day trip from Lisbon to Sintra and Cascais. Stop first at Pena Park, head to the Queen's Throne for an amazing view of Pena National Palace and the Atlantic Ocean. Then enter the whimsical, Romantic-era Pena National Palace to admire the Arab Room and the detailed features of the king’s and queen’s bedrooms. 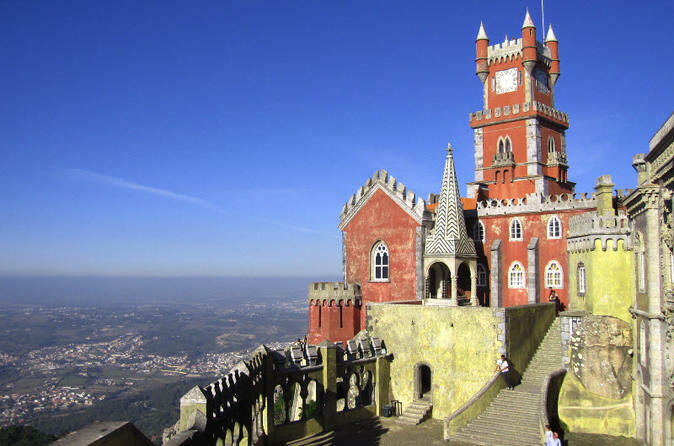 Continue to the historical center of Sintra, and enjoy free time to explore the town or have some lunch (own expense). Next, admire the landscapes of Sintra Natural Park on your way to the cliffs of Roca Cape and the surfer's paradise of Guincho Beach. Pass the cliff at Hell’s Mouth and stop to stretch your legs along the bay in Cascais. Wander around the center of Cascais, and then enjoy scenic views of the Atlantic coast and the town of Estoril on the drive back to Lisbon.